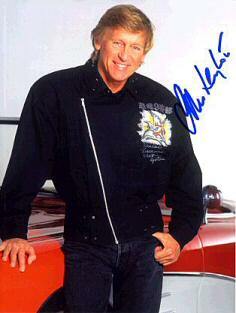 John Leyton made his professional debut as an actor at the Theatre Royal in York. Whilst there he was spotted by Granada Television and offered the part of Ginger in the TV series "Biggles" which ran for a year and gained John a strong following of teenage fans. Under the management of impresario Robert Stigwood, John returned to Londodn and was offered a guest starring role in a soap type series called "Harpers W1" in which he was to portray a pop star. The character was required to sing a song called "Johnny Remember Me". EMI released it as a single and within two weeks it was No.1 in the charts. As a result, John became a teenage idol and was voted 'Newcomer of the Year' while his record was acclaimed 'Best Song of the Year'. Advance orders for his follow up single "Wild Wind" exceeded 300,000 copies, resulting in the record rocketing straight to No-2 in the charts prior to its release date! These hits plus "Son This Is She" and subsequent records and albums continued to sell around the world, achieving Top 10 status in countries such as Australia, New Zealand, Israel, Japan and throughout Scandinavia and the Far East. Despite having experienced phenomenal success as a pop singer, John decided to return to acting. His motion picture debut came when he was cast as 'Willie the Tunnel King' in the classic war movie "The Great Escape" which featured a star-studded cast including Steve McQueen, Charles Bronson, Richard Attenborough, Gordon Jackson, Donald Pleasance and James Garner. Returning to England from his home in Hollywood, John involved himself in film production in an executive capacity. Apart from his work as an actor, writer and producer, John Leyton was also Chairman and Managing Director of a company which owned the well known London restaurant The Meridiana, and he subsequently put his expertise behind The Market Bar restaurant in Portobello Road. Following constant demand for guest and personal appearances, John eventually succumbed and stepped onto a stage for the first time in 28 years. In November 1993, he was invited to appear as one of the 'special guests' on the Capital Gold Anniversary Concert at the Royal Albert Hall in London. Following that show, John raced to Caesar's Palace in Luton where he joined Marty Wilde and Eden Kane for a special one-off production of the "Oh Boy!" show. Such was the reaction to John's performance that night that he decided, there and then, to make a full time return to the entertainment business. In 1994, John Leyton joined forces with Marty Wilde & The Wildcats, Joe Brown & The Bruvvers, Eden Kane, The Vernon Girls and Rockin' Horse to undertake a 51 date UK tour with the "Solid Gold Rock 'n' Roll Show". Such was the success of that first tour that more took place in 1996 and 1997, with the same line-up of artistes, including the London Palladium in its long itinerary. It seems the show with its format of house-hold names and nostalgia has acquired cult status and attracts audiences back again the next time around, somewhat akin to old friends meeting for a celebration! Between mid September and mid December 1999, the "Solid Gold Rock 'n' Roll Show" undertook yet another UK tour playing to house-full business for 74 performances at 62 venues, again including the London Palladium in its long itinerary. The career of John Leyton has successfully meandered its way through various facets of the entertainment industry. Time, which is divided between live appearances and touring, script writing and production, and discussing new television projects and involvement's is a precious commodity to him. The one thing that remains constant is, that John has always been a major attraction wherever he appears. 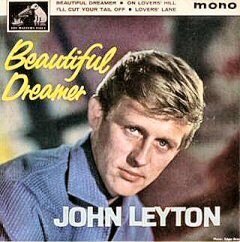 John Leyton was born at Corners, The Crescent, Frinton-on-Sea, Essex. John's 30" waist measurement is exactly the same as it was in 1961. At the age of 5, John's parents divorced and he was sent to live with an aunt in north London. At the age of 6, John was sent to boarding school in North Wales. His first TV appearance was as an 'extra' in "The Invisible Man". John decided to become a pop singer because so many girls wrote to him while he was making the "Biggles" TV series suggesting that he looked like a pop singer! John's initial training as an actor was at the Actors Workshop prior to going into Rep.
John's mother was an actress and appeared in a production of "Floradora" at Daly's Theatre in London - now the Warner cinema. John was educated at Highgate School in north London and lived with his father and step-mother. Whilst at Highgate, he joined the Dramatic Society for the sole purpose of getting out of Latin lessons. John represented Southern Schools at boxing (middle weight) and swimming the 50 yards freestyle. John Leyton was the first artiste to be managed by impresario Robert Stigwood who would later manage The Bee Gees and Paul Nicholas, amongst others. "Johnny Remember Me" was voted a 'miss' by the panel of Juke Box Jury, although just 3 months later it was voted 'Best Single of the Year' in a national poll! Immediately on hearing "Johnny Remember Me", Beatles manager Brian Epstein put in an order for 300 copies for his NEMS store in Liverpool. John Leyton went to Hollywood in 1964 to shoot the interiors for "Von Ryan's Express" and remained living and working there until 1972. John starred in the US Network TV series "Jericho" for CBS. While in Hollywood for MGM, John met and became friendly with Elvis Presley who was filming on the next stage. It was John Leyton who introduced Mia Farrow to Frank Sinatra while filming "Von Ryan's Express"……the rest is marital history! John was nominated by American Cinema Editors Inc for 'Best Performance By An Actor' in "Guns at Batasi". John was turned down by EMI before being taken on by the legendary Joe Meek who produced "Johnny Remember Me"……..which was then released by EMI! Although having already made "The Great Escape", John was required to screen-test for 20th Century Fox to get the part in "Guns at Batasi". John successfully tested for the role in "Guns at Batasi" with Britt Ekland. Britt Ekland walked off the film after only one week so as to join her new husband Peter Sellers in America. 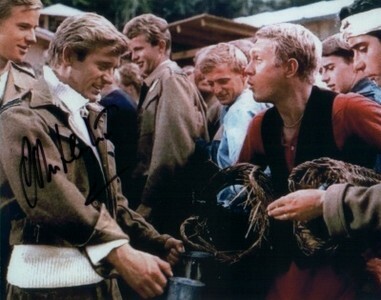 In Seller's biography he states "I ordered Britt to leave the film and join me in Hollywood, because I was extremely worried about John Leyton's reputation for bedding his leading ladies." The film John is most proud to be associated with is "The Great Escape". John's biggest disappointment? Not bedding Britt Ekland!